I got the second "Will Draw for Links" entry today from Cedarfield. 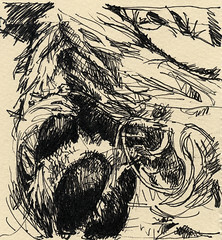 I had been sitting on this drawing of my dog's leg, but Cedarfield is a Pappy aficionado. I think she'll give it a good home. Yes, indeed! It resides in the place of honor near my desk.